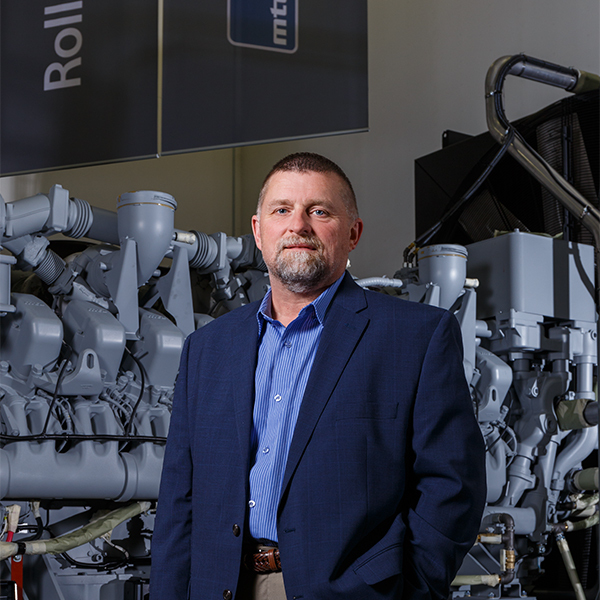 Todd Riemann leads MTU Onsite Energy after 32 years with the company, rising from entry-level assembler to CEO and creating an innovative trade training program for students in the area along the way. There is a well-worn path between MTU Onsite Energy CEO Todd Riemann’s big, windowed office to the production floor on the other side of the building. “Todd is a very humble leader and remembers where he started,” says John Haack, a former colleague who nominated Riemann for Business Person of the Year. “To this day it is not uncommon to see Todd dressed in jeans and a t-shirt working on the assembly line.” That could be because the assembly line is where Riemann started with the company more than 30 years ago, back when MTU Onsite Energy was locally-owned Katolight. He started with that company just a couple of years after high school, in 1984, as an entry-level assembler. Now, 32 years later, he has made it to the top. Riemann adds that although he has jumped in to help assembly and in the field, it is not as common today as it was earlier in his career. A quick learner, he also proved to be a genuine teacher. That is just one of the sentiments in the nomination for Riemann this year. He was in a group of many other deserving nominees given to the Minnesota State University Mankato College of Business for voting. He came out as the top vote getter, in part, because he is not only dedicated to improving himself, but the company he works for, his employees, and the community, too. He is proud of the MTU Onsite Energy accomplishments. Accomplishments he believes even his neighbors in the greater Mankato region may not be aware of. “Technology in manufacturing is amazing in this day and age,” says Riemann. “I think more manufacturing tours in the greater Mankato area would be great because people drive around and wonder ‘what’s behind those walls?’ They may not realize that MTU ships generator sets around the world. I mean a telephone may be working in a hurricane because of us. You might know someone in a hospital in Florida or Guatemala being able to complete surgery during a hurricane because of us–we need to share those stories. Now owned by Rolls-Royce Power Systems, MTU Onsite Energy continues to be headquartered in Mankato where it manufactures industrial power generation equipment that provides reliable solutions for a myriad of power generation needs. Featuring low fuel consumption, long service intervals and low emissions, the generator sets can be placed anywhere ranging from a hospital to a data center, to other manufacturing plants. There are numerous applications for customers worldwide, anyone who needs a reliable backup power source. Riemann talks about his rise to the top of the global company based in Mankato, the role he is playing in helping with the workforce issues the region is facing, and why he believes the MTU Onsite Energy global footprint will always be firmly planted in Southern Minnesota. Let’s start from the very beginning, did you grow up in this area? I grew up in the area I guess, what I mean by that is I didn’t grow up in one specific area my whole life. I was born in Mankato. My family moved to Good Thunder and I started kindergarten at a parochial school. I then transferred to the St. Clair public school system where I graduated in 1982. I am thankful for the opportunities I had there. During my junior and senior year at St. Clair, I had the opportunity to take vocational studies through the school. I’m the type of person that loves working with my hands, it doesn’t matter if it’s mechanical or electrical. But what is really intriguing to me is carpentry. My brother-in-law and one of his good school buddies started a construction business and during the summer I would work for them building houses and steel roofs. I graduated high school certified in building trades through the Waseca vocational studies program. After graduating high school I was employed by a local construction company in woodworking. When did your tenure at Katolight begin? A couple of years after high school a good friend of mine called me up and said, ‘Todd, I really think you’d like a company called Katolight.’ Back then, we didn’t have the Internet, so I couldn’t just look up the company. My comment was ‘well, I don’t think I see myself building light bulbs!’ And he laughed and said no, they make generators. I thought about it, I interviewed with Lyle Jacobsen, the owner at the time, he hired me and I started working for Katolight in 1984. Your friend must have been right, you are still here so you must have liked it. The company has offered so many career and growth opportunities. I started on the assembly line building generators. I was on the production line for three years, then I was promoted into production test, an area where all prototype and production gensets are tested. After being a tester for a year, I was then promoted to our service department. In the Katolight days, I became the second parts and service technical resource. It was another growth opportunity for me and I had some great teachers. Dan Kapsner and Bob Conrad both had long careers with Katolight and taught me a lot about power generation. I also learned a lot from engineer, Mike Dauffenbach. I started working in after sales support and that’s where I’ve worked most of my career, about 27 years. I’ve got a strong technical ability and knowledge within both the electrical and mechanical side of power generation. You did take a brief break from Katolight. Yes, at that time I was managing parts, service, warranty and training. Some things changed, so I explored another career opportunity working for Ziegler Caterpillar in the metro area for two and half years. In 1997, a field service opportunity opened at Katolight and I returned to the organization, where I built a 10-year career growth path through the after sales department. Then in 2007, a German company, Tognum, purchased Katolight which presented additional career opportunities. Let’s talk about when Katolight, a locally-owned company, was bought by Tognum a global industrial equipment company. Were you shocked when that happened? And Tognum did an amazing job of transitioning ownership. They took us from a privately-owned, family-owned business to a publicly-traded company. It was amazing how the organization transitioned so smoothly. Tognum made the employees feel like a large part of the family, part of the global team. They had a strategy and took methodical steps to integrate the organizations. With more than 300 employees at the time, it could have been much more difficult. The corporate team did a tremendous job with the integration. Since 2007, we’ve had more growth and change–Tognum sold to Daimler/ Rolls Royce. Then in 2014, Rolls Royce bought Daimler out and we are now solely owned by Rolls Royce. You are CEO now, but when Tognum first purchased Katolight, they sent someone from Germany over to run this location? After Katolight was acquired, Armin Groeber relocated from Germany to lead the Katolight to MTU Onsite Energy transition as CEO. Armin really took me under his wings. I must have done something that caught his attention, because he really taught me a lot and believed in me. At the time I was leading the training department and Armin asked me in 2007 if I would be willing to return to after sales and lead that team. I accepted the role as Director of After Sales in 2007. In 2009, Armin then approached me again and said ‘Todd I have another task for you, I would like you to be our COO.’ I’m like…’hmmmm, wow this is a compliment but I need some time to think about this one.’ So I visited with my family and I decided to accept the challenge. I’ve always thrived on challenges. Armin wanted to sit down again and in 2010 he said ‘hey I’m going back to Germany, therefore my seat will be vacant, and I would like you to take the position of CEO. And once again there was some thought that went into it, but I accepted and in 2011, I became COO/CEO of MTU Onsite Energy. You’ve had a wonderful climb up to the top of the company, was it just your yearning to learn and work ethic or…? I credit my parents and how they brought me up in the world. They taught me to respect people and to have a strong work ethic. They showed interest in me and let me be involved and interested in what they were doing so I could learn from them. I credit my father a lot on that because I was always tugging on his shirt when he was working on the vehicle, wiring something or building something. I was always there wanting to learn and understand how things work. It probably drove him crazy, but he was patient and I was learning from him. I was particularly intrigued with electricity. One day at a very young age I asked my dad, ‘how does it work? He said I’ll tell you two things you need to remember about electricity. The first is to think of water flowing, because it runs like water even though electricity and water don’t mix. And he said the last thing I want to do is tell you to truly respect it, never get comfortable with it. So as time went by that was always in the back of my head. What does he mean it is like water? One day, I was doing something and I turned the faucet on, did what I needed to and turned it off again. And I thought, “Hmmm”. I turned it back on and shut it off. Then I went over to the light switch, turned it on, turned it back off. And I thought, “Aha”! It all made sense to me, what he had shared with me. So driving him crazy, always being in his way actually provided me the stepping stones to where I am today. I share with him as often as I can that I appreciate him and all he did. Do you think with technology and just general busy-ness today, that that type of native, hands on learning isn’t as prominent? That’s one of the things I think that is lost in today’s world. I remember one time someone knocked on the door and said ‘I want to work for you’ and I thought that’s great. But you are just out of high school. You have great knowledge, but what do you have for skills. Very little if any, in today’s world. So I took it upon myself to initiate and introduce a high school apprenticeship program, the Youth Employment Acceleration Program (YEAP). We are in our third year and we are gaining momentum. We’ve already had a handful of students from District 77 participate in the program. Our mottos are A Clear Direction to Your Future and Earn While You Learn. The program offers high school students an opportunity to work in and learn all of the aspects of manufacturing. The students enter the program as high school juniors, working up to 2 hours per day for a minimum of 450 hours. During their senior year, they work up to 4 hours per day for a minimum of another 450 hours. The idea is to get them interested in manufacturing and working with their hands at a young age. The program has recommended prerequisite coursework that they start as early as their freshman year. As a sophomore the students apply to the program and participate for two years, committing to a minimum of 900 working hours throughout the program. It does more than teach them knowledge, it teaches them career skills and it builds a work ethic. They learn how to be a part of a company. The students apply and go through an interview process. It sets them up for the future with valuable career skills. Currently, MTU Onsite Energy, EI Microcircuits and Kato Cable participate in the District 77 Youth Employment Acceleration Program. I am very proud of the YEAP program. The program is growing and improving every year. The plan is to take the program outside of Mankato and provide more opportunity for students throughout the region. Are other manufacturers in the region interested in YEAP? There is a lot of interest in YEAP from other manufacturers in and around Mankato who ask how they can be a part of it. First and foremost, my answer is yes, we want you to be a part of it. Secondly, yes, I’ll share what I can to build a similar youth apprentice program within your area. The program itself requires a lot of attention and support to be successful and one thing that has been a big plus for this is District 77 Superintendent Sheri Allen. When I first had the vision for YEAP, she listened and believed in my vision. YEAP takes a lot of support and commitment from the schools, the counselors and the teachers to make the program successful. The next challenge is at the state level. The state needs to consider how to better support the schools so the schools can support the program. Upon completion of the program the students receive a Youth Apprentice completion certificate from the Minnesota Department of Education. The goal is to offer other stackable credentials such as manufacturing certifications and post-secondary coursework credit. We want to bring other manufacturers into YEAP once we can support the program properly. How many students have taken part in the first three years? We’ve had seven students receive YEAP certificates to date. However, we are creating more buzz and interest in the program. In fact, this year we have two female students who started working at MTU in August! I remember how the federal and state governments embraced and promoted the No Child Left Behind vision. My vision is a qualifying student does not need a 4.0 GPA. We want students that can enter the program and understand the hands-on skills, have a work ethic, and then we build them up. I know there are families that can’t afford a post-secondary education and some students just don’t want that. So we are trying to give everyone a chance as long as they are willing to work for it and learn. I know we can grow them in this program. And if they choose to stay in the area and work for MTU when they graduate, we’ll hire them for open positions. After all, we already have two years invested in them. Governor Dayton took notice of what you are trying to do. Yes, I now have a voting seat on Gov. Dayton’s Minnesota Workforce Board. We meet quarterly. Greater Mankato Growth President and CEO Jonathan Zierdt saw there were changes in the federal law which would allow private business to have a voice on the board, so he asked me to apply for a position on the board. I sat back and thought, ‘oh I don’t know if I am worthy of this,’ but after giving it some thought, I went through with the process and applied, which included multiple interviews that were very demanding. Then I received a call saying that I had been appointed to the seat. It’s a three-year term and I am just finishing up my first year. They have a total of four meetings a year. I see this as another stepping stone for the YEAP program, as well as what we are facing within our workforce as a whole in this region. It gives Mankato that voice, the manufacturing sector a voice and I really enjoy it. I’m proud to be a part of it. Speaking of workforce, how many employees do you have here in Mankato? I am going to be very specific with this answer. At the time of this interview MTU Onsite Energy employees 308 people, between both manufacturing facilities. Is that about what it’s always been? We’ve been in the low 300 employee range for a few years. We have two manufacturing locations in Mankato, our headquarters at Power Drive and another location at Lundin Boulevard. Over the years we have prided ourselves on implementing Lean Processes which allow our employees to be cross-trained and thus allow for more flexibility and knowledge transfer. How are the two facilities different? Power Drive is our large bore production facility where we use the 20V and 16V engines to build large generator sets with power ranges from 650kW – 3250kW. Currently, the Power Drive facility is producing 15-20 units a week. Smaller generator sets are manufactured at our Lundin plant. These range in power output from 20kW – 600kW. Currently, we produce 90-110 units a week at our Lundin Boulevard facility. We currently operate one shift at both locations thanks to our cell assembly flow and excellent manufacturing takt time. Takt time is defined as the available production time divided by the customer demand, which is the heartbeat of our assembly line. Our takt time at Lundin is 27 minutes. So every 27 minutes the units in the assembly line move forward. At Power Drive, we are at about a 3 hour takt time, the assembly process is much more involved with the larger generator sets. We are on a good pace. Total numbers will likely be 3,200 – 3,500 generator sets out of this facility this year. How is the power gen business? Business is good. Our products provide power to a large variety of customer markets from telecommunications, hospitals and data centers to agricultural facilities and municipalities. Really, we serve all needs. We build a standby product that is similar to an insurance policy. As an example, a hospital needs a reliable generator set so if they experience power loss, they have a backup power source to depend on. MTU Onsite Energy also manufactures prime power and continuous power generator sets, which are especially helpful in areas of the world without a stable or adequate power grid. The key to success in any business is the people. It’s truly the people that you have that make a successful team. One person cannot make a successful company on his own. You can be a good leader and a good mentor, but you still need the foundation of a great workforce to be successful. I am very sincere when I say, we have the best group of people and we couldn’t do it without them. Do you have much turnover in personnel? Every business experiences turnover, especially in times of change, but we also have many members of our workforce with over 30 years. In fact, last week I had the honor of celebrating 40 years of service with an employee. We work hard to retain good employees, which can be challenging these days. The next generation entering the workforce is very energetic. It’s a generation that’s really going to change things as they are aggressive and technology driven. The challenge is they thrive on innovation and expect to see new technology frequently. We have a lot of young people entering our organization and I am happy to say many have now been with MTU Onsite Energy for five years, six years and that says a lot about our organization. I attribute it to our family atmosphere.We really operate as a family here. How do you keep such a huge company feeling like family? Constant communication is one way. We have quarterly town hall meetings to bring the team up to speed with what’s going on locally and globally. I don’t feel you can communicate enough, our culture is curious. The point of the town hall is to talk about our financial performance, talk about what’s coming up and any changes within the company. I also let everyone know there is an open floor for questions and my door is always open if they don’t want to speak in front of the group. I used to hold town hall meetings each month, I might go back to that. With this industry and this company a lot happens in three months’ time. Through all of the acquisitions, they kept MTU Onsite Energy in Mankato. Mankato is a great, great city. It’s amazing and it just keeps getting better. One factor is what the colleges here do to support the area with talent. It is second to none. And look at how Greater Mankato Growth has developed. Just the leadership of this town and the continuity within the town is amazing and I hope we never lose sight of such a thing. We have done a lot to build on our strengths. Mankato is very ag centric so we now have the Green Seam and I am really pleased with that. It’s going to bring the needed light on this area and bring infrastructure to those businesses that really need it. Mankato is also a retail hub. I will say, I’d like Mankato to embrace the river more, rather than just build a wall with a mural. Milwaukee and what they’ve done with their riverfront is a good example, embrace it! It’s one of the few rivers that turns north and we should be proud of that and work with it. Do you have time for hobbies? I have to make more time for hobbies. I love spending quality time with my family. I have three children and six grandchildren. I also love the outdoors; which includes a broad array of things like hunting and fishing, but most of all I enjoy the outdoors with my wife, specifically when it comes to kayaking. We are now what you call “empty nesters”, so we have increased our outdoor activities which includes learning to kayak, quite interesting for a guy that doesn’t like water! I still have a very strong interest for carpentry and wood-working and I am equipped with all the tools I need and I just love it! This may sound goofy, but I need to keep my brain active! It is always overactive at the office and I need to keep it that way, so this is where my hobbies come into play. MTU Onsite Energy manufactures diesel generator sets, gas generator sets, power modules, components, gen drive engines, and medium speed generator sets. MTU Onsite Energy offers more than products, services, engineering, and technology. Our power brand values provide orientation to our worldwide network of employees, customers, and partners. By taking a clear position we are offering a promise which can be measured at any time. This is the basis for a culture in which quality and performance are consistently demanded and enhanced. For us this is the driving force for maintaining our claim to leadership. Power: MTU Onsite Energy is one of the world‘s leading providers of diesel and gas systems based on diesel and gas engines. High-Performance. Global. Reliable. Solutions: MTU Onsite Energy provides custom-made system solutions – from order and project management to completion of the turnkey system, from engineering to service. Flexible. Customer-Centric. Cooperative. Innovation: MTU Onsite Energy is an innovative leader in intelligent and future-oriented energy systems at the highest technological level. We are setting the standards for diesel and gas engine systems. Intelligent. Open. Fascinating. Sustainability: Climate-neutral, regenerative energy sources will continue to play an increasingly important role in our future. MTU Onsite Energy is taking on the responsibility for tomorrow‘s needs with innovative solutions for a better and more sustainable energy supply. Environmentally conscious. Efficient. Trustworthy. A quick Google search will show that the demand for skilled workers is growing throughout Minnesota and a slowdown is not in sight for the next decade and a half. In fact, according to the Center for Rural Policy and Development, manufacturing jobs in greater Minnesota are projected to increase by 9 percent by 2020. That means more than 12,000 additional workers will be needed to fill them. YEAP is one way Riemann shares his passion for business, growth and manufacturing. His dedication and collaboration with District 77, the Minnesota Department of Education and other local businesses is bringing the program to fruition. YEAP is an apprentice program that offers high school students real world training and hands on work experience in manufacturing along with the opportunity to build and develop usable skillsets.